Our Pastor, the Very Reverend Elias Nasr, was born December 2, 1953, in the Holy Land, Attaybeh, which is known in the Old Testament as Ophra. Attaybeh is the place to where Christ withdrew after raising Lazarus. Father Elias comes from a family with a long history of service to the Lord in the Holy Priesthood. Father Elias is a ninth-generation priest and there are many priests and bishops in his extended family. As a boy, Elias Nasr came with his family to the United States in September of 1964. He attended West Virginia University, where he earned a Bachelor of Arts degree in History and graduated with a baccalaureate degree in 1976. With the Blessing of Metropolitan PHILIP, Elias Nasr was ordained a priest by the hands of Bishop ELIA (now Metropolitan ELIA of Hama) on December 9, 1979. In May 1996, Fr. Elias was elevated to the rank of Archpriest by the hands of His Grace Bishop ANTOUN. Fr. Elias has served the communities of St. Nicholas in San Francisco, California; St. Mary in Berkley, Michigan; St. George in Cedar Rapids, Iowa; St. George in Detroit, Michigan; St. George in South Glens Falls, New York, from 1992-2002; and most recently as pastor of St. Elias in Austin, Texas. Fr. Elias returned to South Glens Falls, New York, in September 2004 to minister at St. George. 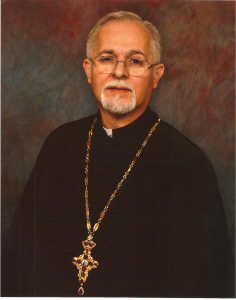 In November 2009 St. Elias Antiochian Orthodox Church graciously welcomed Fr. Elias as their pastor.